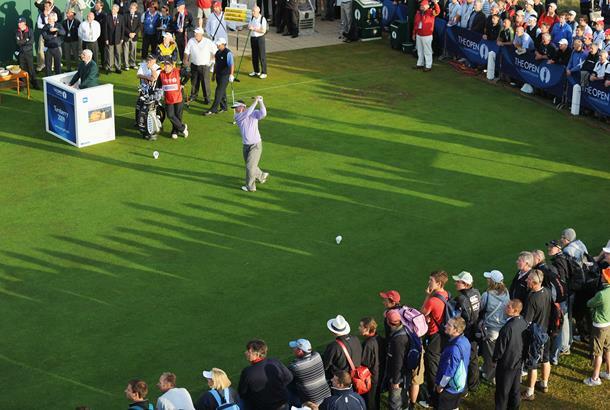 The 138th Open Championship at Turnberry got underway at 6.30am with England's Paul Broadhurst firing the first tee shot of the tournament. Broadhurst found the centre of the fairway with a rescue club, while former US Open champion Michael Campbell laid up short of the bunkers and Mark Calcavecchia found the first cut of rough with a 3-wood. All three started with pars in perfect conditions with very little wind. "This is something new to me as I have never been the very first out in a Major," said Broadhurst, who woke up at 3.45am. Another first for Broadhurst is playing a competitive round alongside Campbell. "I've been friends with Cambo ever since he come onto the European Tour." "But the strange thing is that we have never ever played a competition round alongside each other and that's hard to believe given that I have been out here for 21 years. "Cambo hasn't been out here as long as I have but we must have been out here for 16, 17 or 18 years. "But it's an excellent draw for all three of us and lets hope we can take advantage of these great conditions." The weather has stayed fine as the rising sun begins to burn off the milky cloud that's been lingering in the sky and there's definitely a good score to be shot out there. A number in the 60s is a very real possibility for the morning starters and those in the second half of the draw will be hoping the weather stays fair for them. The early pace has been set by Mark O'Meara who is -2 through three holes while Calcavecchia and Oliver Wilson are also under par at -1, the former having played seven.